The Caron utility vehicles are all diesel powered, four wheel drive and with a pivoting chassis giving exceptionall all terrain performance. The new C Series replaces the very popular 700 & 800 models which have proved ideal for use in the UK. The C Series has two seats with a fully protected forward tilting safety cab and a carrying capacity of up to three tonnes. Prices from £26,400. 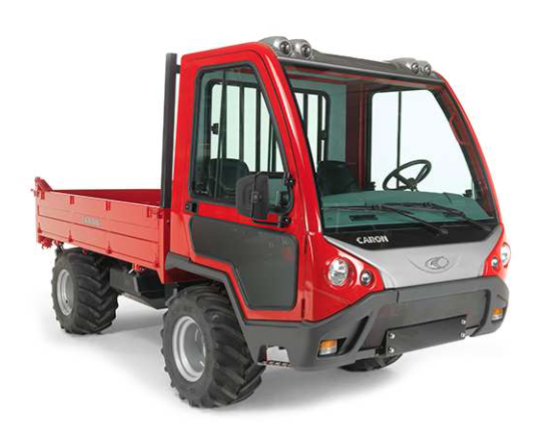 The new C and larger CT series with a capacity up to six tonnes, have split braking systems, a 24 speed transmission, which is capable of 40kph, also a two speed PTO. and three point linkage can also be fitted. The bodies tip three ways and are designed for easy removal and replacement for different operations..